On this quiet September Saturday morning, news reports, Twitter feeds, Facebook posts and the rest of Ranger world is reporting that Wade Redden will be waived today (around noon) by the Rangers. Apparently, he had shown enough in camp (or the youth had shown enough) to convince the Rangers that the time to act was now. Larry Brooks at the Post tweeted the story early this morning. TSN has reported it as well. Obviously, we will know more as the day progresses. Vacancy on the back line and in payroll? It will make tonight's game against the Devils interesting because Redden was expected to play. 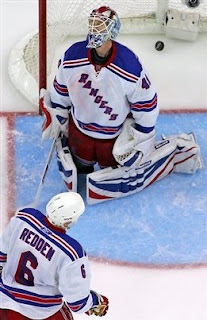 Official Rangers' announcement is here that the Blueshirts waived Redden. If no team claims him, he is required to report to Hartford if he wants to keep his contract. According to the article, Glen Sather told reporters that placing Redden on waivers -- and thereby removing his salary from the Rangers' salary-cap picture -- was the right thing to do for the team and will help the organization pursue its goal of giving younger players an opportunity to make the roster out of training camp. Redden advised that he will take a couple of days off to consider his options. come on now. how many people would kill for a job like reddens. at 6.5 mil per year, he's got it made, most of us won't see that kind of money in 3 lifetimes. what does he mean he's going to take a couple of days off to consider his options. sounds like he's playing his waiver option like he's played his hockey !!!! I'll be so happy to see Redden gone! worst contract ever! sather should chew a shotgun barrel the way he does those cigars!